The FlexPoint 10FL/2 is a 10BASE-FL fiber to 10BASE-2 coax media converter. The FlexPoint 10FL/2 connects and extends coax segments via fiber.No manual configuration is required with the plug-and-play FlexPoint 10FL/2. Connect the fiber and coax cables and the installation is complete. The fiber port operates at 850nm or 1310nm and features ST connectors. Multimode fiber models support distances of up to 5km, and the single-mode fiber model supports a distance of 30km. The FlexPoint 10FL/2 is a 10BASE-FL fiber to 10BASE-2 coax media converter. The FlexPoint 10FL/2 connects and extends coax segments via fiber. No manual configuration is required with the plug-and-play FlexPoint 10FL/2. Connect the fiber and coax cables and the installation is complete. The fiber port operates at 850nm or 1310nm and features ST connectors. Multimode fiber models support distances of up to 5km, and the single-mode fiber model supports distances up to 30km. 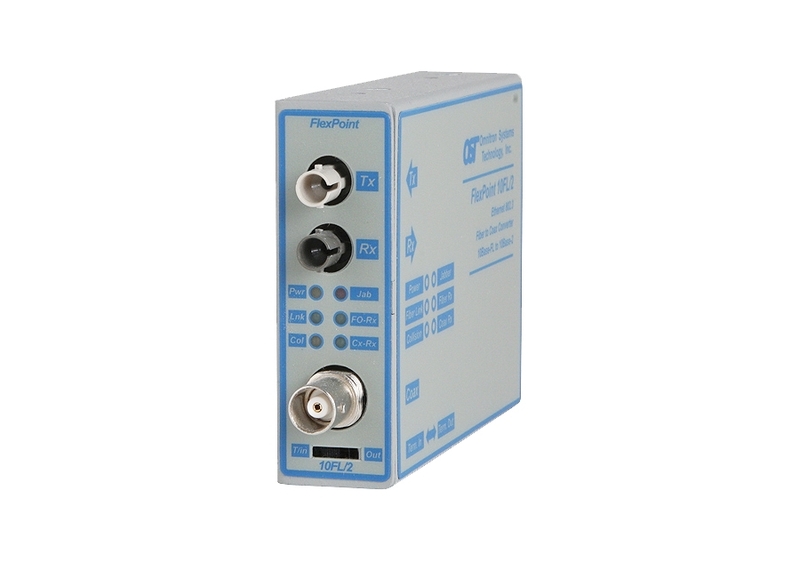 The FlexPoint 10FL/2 features a BNC connector supporting 50 ohm cabling with distances up to 185m. Per IEEE 802.3 standard, up to 30 workstations can be attached to the coax segment. A termination switch provides a convenient 50 ohm cable termination. Descriptions of the LED indicators are provided on the label for easy in-the-field installation and maintenance. The LEDs report the availability of power, port activity and link status, collision and jabbers. 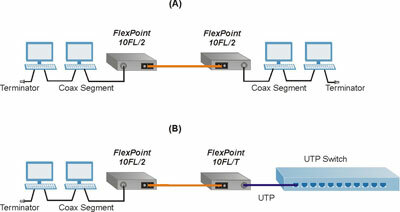 A pair of FlexPoint 10FL/2 media converters (A) enable two separate 10BASE-2 coax segments to be connected via fiber, extending network connectivity. A FlexPoint 10FL/T (B) provides connection to a UTP switch and extends the network via fiber to a FlexPoint 10FL/2 connecting multiple workstations on a 10BASE-2 network segment. In both cases, multimode or single-mode fiber can be used. Network connectivity can be extended up to 30km using single-mode fiber. 1When operating in half-duplex, the maximum distance is 2km.